Recommended by the major travel guidebooks guidebooks including Rick Steves!! Created by David and Christine Harper in 1990, this original and authoritative tour covers the Eagle’s Nest, as well as Hitler’s former HQs and the underground bunker complex. This history-intensive tour is conducted by professional guides who are accredited for Third Reich / WWII history and whose mother tongue is English. They conduct the tour in an objective and comprehensive manner, making the history of the area easily understandable to all. What is the “Eagle’s Nest Historical Tour”? Our four-hour, educational, 3-part tour emphasizes the historical significance of the whole mountain, not just the Eagle’s Nest teahouse. 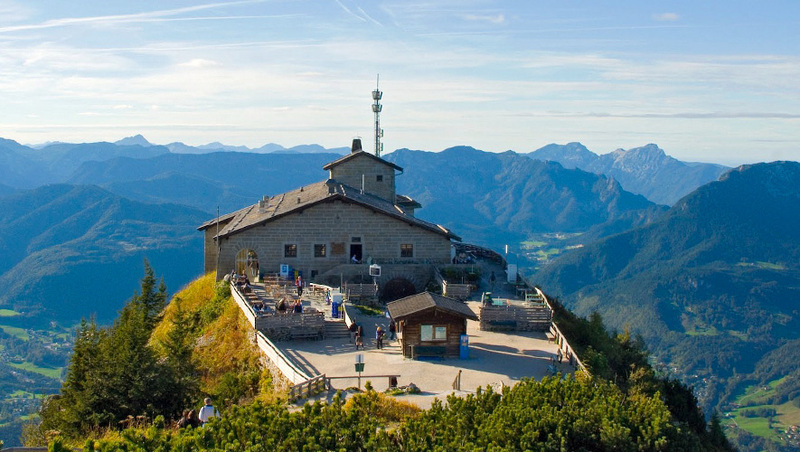 Including all coach and mountain bus transportation, as well as the elevator ride through the mountain, the fully guided tour starts with the story of Obersalzberg, a tiny community above Berchtesgaden. Here the history of the community’s takeover by the National Socialist Party and its transformation of the mountain into Hitler’s Southern Headquarters will be recounted. During the driving tour you will view some original Third Reich buildings dating back to when the area was Hitler’s second seat of government, including driving by the location of Hitler’s former home, the ‘Berghof’, no longer standing today. The description of Obersalzberg and the importance of Hitler’s Berghof in world history will be made easy to understand with the use of original photographs. At Obersalzberg, you will also be shown one of the underground bunker complexes below the mountain. The extensive fortress-like system was built as an air raid shelter, as war headquarters and as a possible last refuge for the leaders of the Reich. To access the bunker we walk through a portion of the Documentation Center, an educational facility recounting the history and terror of Hitler’s Third Reich. You will then board a specially equipped mountain bus for a breathtaking drive up the 6.5 km (4 mile) road with its 27% incline to a high mountain parking lot, just below the ‘Eagle’s Nest’. The original brass-lined elevator will then transport you up through the heart of Kehlstein mountain straight into the building itself. After an in-depth tour of the Eagle’s Nest (now a restaurant) you’ll have some free time to enjoy the views or refreshments. On the return journey to Berchtesgaden the guide will recount the demise of some of the Third Reich’s leaders who lived on the mountain. 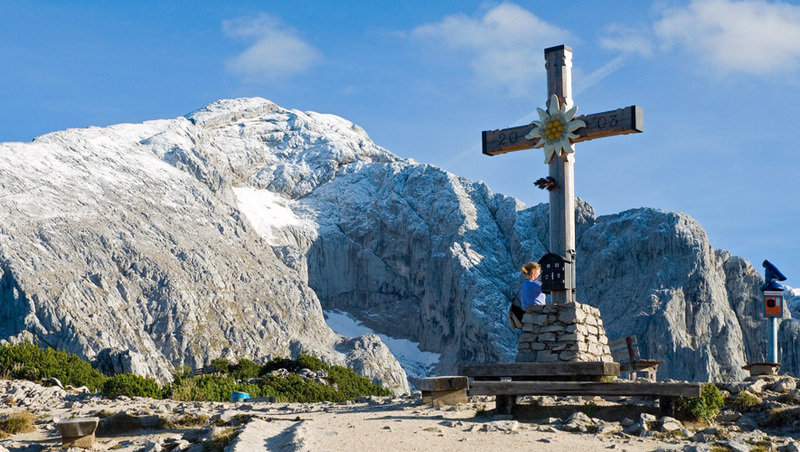 The Eagle’s Nest Historical Tour is offered daily, departing from our office in Berchtesgaden at 1:15 p.m. It runs when the Eagle’s Nest is open, (from mid-May through October, weather permitting) and lasts about four hours. The price of the tour is EUR 55 per person (active duty military, students and seniors of 65 and over qualify for a EUR 3 discount) and EUR 38 for children from 8 through 14 years of age (due to the intense historical focus of this tour we do not accept bookings for children under 8). The price includes all entrance fees and transportation. 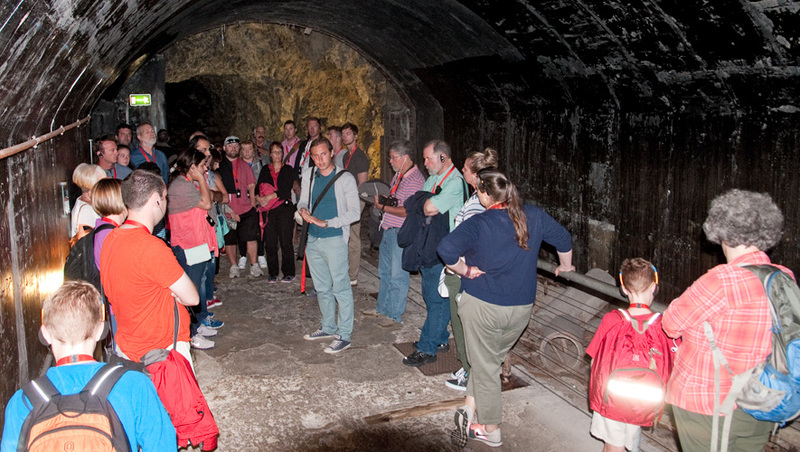 As our tours are limited in size, it is advisable to book in advance. Those with limited mobility may prefer to book a private tour with us where we can tailor the program to a slower pace and reduce the number of stairs if need be. The local coach company that we contract for our tours has no wheelchair ramps in their buses and our tour participants need to climb up the 3 or 4 steps to get into the bus. The Documentation Center and underground Bunkers are accessible to wheelchairs, however when we leave the Documentation Center, our tour participants need to climb up two flights of stairs and cross a long parking area and then walk down one flight of stairs to get to the Eagle’s Nest bus departure point. The Eagle’s Nest mountain buses have wheelchair ramps, however up at the Eagle’s Nest our tour participants need to go down two different flights of stairs to get into the various rooms of the building and go back up them as well. However, if you are interested in Obersalzberg and the bunkers, the Third Reich museum “Dokumentation Obersalzberg” can easily be visited on your own at your leisure and is “wheelchair accessible”. The admission fee is 3 EUR per person and a guide-phone in English is available for 2 EUR. We are sorry that we no longer accept children under 8 years old on the four-hour version of the tour. We, as parents, find that the four-hour history-intensive tour that we offer is tough on a young child’s patience. It starts with a half-hour drive during which the narrative covers Hitler’s life and rise to power. The tour then includes the bunker and Third Reich Museum. The Eagle’s Nest portion is also quite intensive in our description of the construction and use of the building and the final part of the tour goes into the details of the deaths of Hitler and five of his cronies. It is our experience that parents spend half their time trying to keep their babies and young children quiet for nearly four hours, rather than enjoying the tour. An alternative would be to either book a private tour or visit the sites on you own. You simply take the Eagle’s Nest mountain bus from the Eagle’s Nest bus departure point (address: Salzbergstr. 41 Berchtesgaden Germany). Buses depart every 25 minutes and you do not require advance reservation. If you are interested in Obersalzberg and the bunkers, the Documentation Center can easily be visited on your own at your leisure. The admission fee is 3 EUR per person, kids are free and an audio-guide in English is available for 2 EUR.